It was a big hit at my granddaughter's outdoor birthday party! Several ladies asked where I got them in fact. We used two of them to cover the picnic food to keep flies away. Very pretty also and serviceable. Just ordered two more for my daughter-in-law. They are big tents: 48 inches long! These are great for special occasions! Dressy for outdoor events such as weddings yet keep out the little critters at small backyard events. Easy to set up and use and easy take down. Spray off with a hose for those that get food on them. Wish they came in more colors. I used this for a graduation party. Very usefull and it looked great. Wow! These umbrellas are great! These umbrellas easily cover the table and food. 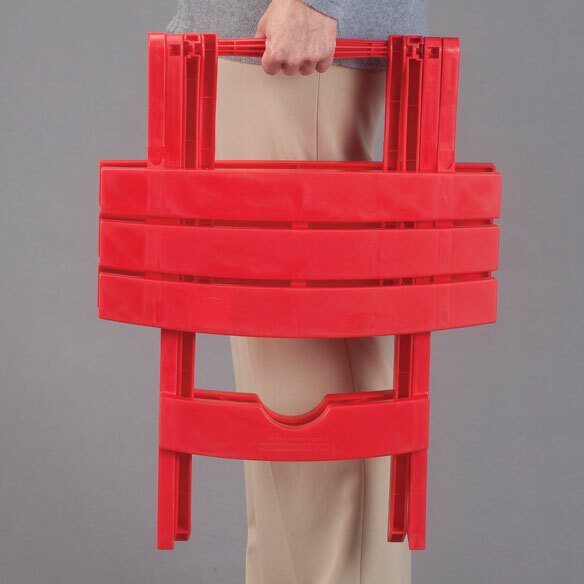 Fold for easy storage. Great for picnics! I think the umbrellas are great. The bigger screens perfect. It makes mores sense to use a few large than several smaller ones. These umbrellas will work great for our pie & ice cream social. We have one in the summer outdoors to raise money for our animal shelter. So we needed something to keep bugs out & droppings from trees. The whole group loved them. This large picnic umbrella was perfect for our table at the Father's Day picnic. It covered all the food we had in the Inflatable Serving bar. Did not need small ones that bump into each other and get in the way. Love, love, love it. I have not used this yet, but it is worth its price in its construction alone. I feel sure that it will do its job. This is great to keep flies off of the food. Use mine all the time when we eat outdoors. Used for a birthday party and it was perfect for the big tray of Food I had. We used for a family gathering received many compliments on how it kept food bug free. Family wanted to know where to purchase so that is what I will be giving as gifts. It served its purpose & easy to clean & store. Will be buying several more. Great price. For use at family/friend gatherings around my daughter's pool in the summertime, when the bugs are hungry! Also indoors, keeping the cats away from food on the buffet table. Great to keep flys off food. Church Homecoming. Endured the breeze. Very attractive for table decoration also. My niece loved them so much she will make a purchase also. It was used for our fourth of July cookout. These work great and very easy to use! 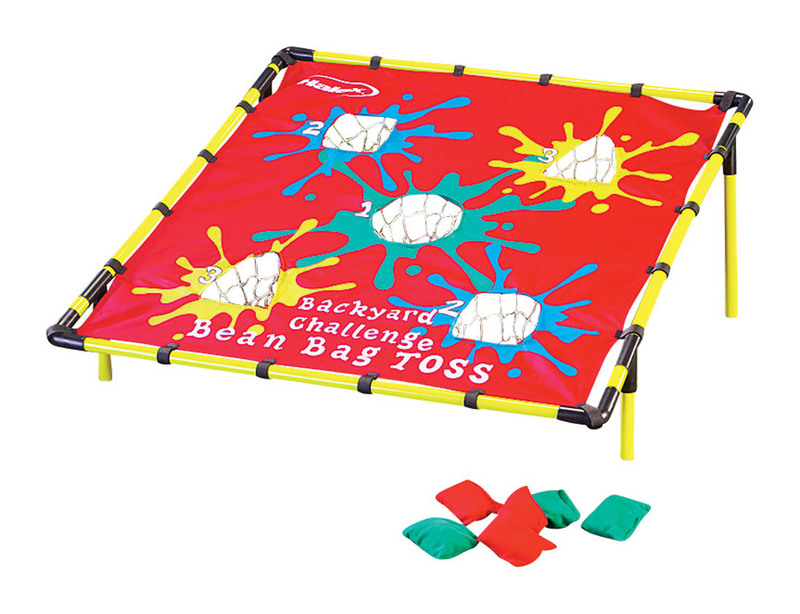 Everyone loved these except the flies! Used it for my grandson's birthday party @ a hotel and it kept flies away from the open food. Very easy to use, convenient and surely keeps uninvited guests (insects) away from food. The umbrella was actually larger than I visualized though the description in the magazine was accurate. It covered almost all of the serving dishes we had on the table and drove the flies nuts (we were of course eating outdoors). I really liked being able to see the various foods offered so I could make a good choice before lifting up the edge and serving myself, putting it back down just before those pesky flies could infiltrate. Works great to keep bugs away from food. The construction isn't very GOOD. The umbrella broke when I tried to close it. Wonderful for keeping the insects out of the food. Easy to handle. Folds small for easy travel. Doesn't stay put very well. Really need items like this with more hieght at ends to cover more food. More weight around bottom. I have purchased several sizes. I would suggest that if you are having cookouts these would be the best to keep the flies away from your food. Great size for covering large platters of food on an outdoor buffet. Easy to use, opens and closes fine, simple like an umbrella. Only thing I can find wrong is it smells like it used to be used for fishing and the smell stuck to it. I will probably use a clip on "Table Cloth Weight" to each side when it is windy weather to add some weight to it to prevent the wind from blowing it off the table. The "table cloth weight" is a metal clip with an attatched fruit shape metal "charm" style and should work well in breezy weather. I used this item in a large church function, so a lot of ppl were removing/replacing it to get to the food . But, with that said the thing was worthless--they were hard to stand up, all were basically broken (purchased 7) and bugs can get under along the sides. While this is a great concept; it needs to be built w/steardier parts and tweek it so that the edges will lay flat. edges to hold it down. Does not stay open like an umbrella. Wire will collapse in and you have to work to get it them back in place. Too much to fuss with. I've purchased these before and been very pleased, but this one broke the first time I tried to use it. I don't know if it was a lemon or this is the new normal, but the construction was really bad. I am disappointed. It was the perfect size. It was made to open like an umbrella, but was defective and was already repaired once. Customer service was very nice and told me she would send me another one to replace the broken merchandise. That was on 06/20/15. Today is 06/27/15 and still waiting for replacement. The food umbrella, I could open but it was lop-sided and fell over to one side. Years ago, I had found the smaller version of this at the dollar store. The ones that covered your plate and drink when you walk away. I thought the idea was great! I have not seen the larger version that is seen here and thought it would be a great idea to cover a larger surface area. Well, the bottom does not sit flat to the table, therefore allowing flies to crawl under and get to your food! I tried bending the metal bars, but this thing will never sit flat. Quite disaapointed, especially since they cost more than a dollar! I bought this for my grandchildren's graduation party. Used it only one time and it broke. I had to throw it out. I was not happy. I ordered 3 small tent covers and they worked fine. Will purchase more of them. Can you replace the one I threw away with the smaller ones? Thank you. i will recomend to my friend. very useful for any ocasion. Great for taking with you camping, can be just slid into the slimmist spaces. Can cover more than one item. I can not find anything not good about this item. For grandchildren's birthday parties that we do outside. Lots of bugs here. I thought shipping was free on orders over $39.00. love this..I needed something to cover our food at holiday cookouts.. I am tired of shooing flying bugs away from my food. To avoid bugs landing on my food during bbq's. have lots of family get togethers with food! I liked the fact that it would cover and keep the flies and other insects away from food. Will fit perfect over the food we put on ice at our cookouts! I am having a picnic for a large group and want the food protected. To keep bug off of food outdoors. Ahhh, these are gifts for my two daughters who like to entereatin outside in the nice weather! To avoid bugs and flies while eating outside. 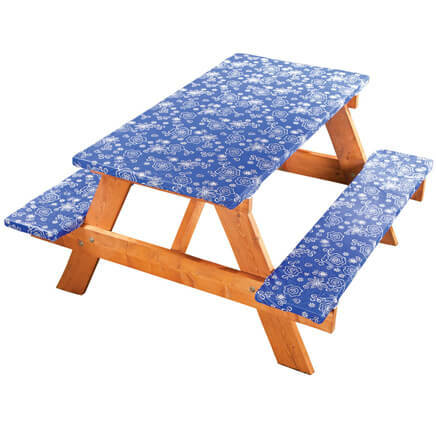 I have the set of three smaller sizes and thought the picnic table size would be a great addition. the smaller size ones really do work for keeping bugs and bees off of your food. the food in large quantities are keep out the mosquitos or any bugs hanging arround. We love having cookouts and bugs are a big problem. 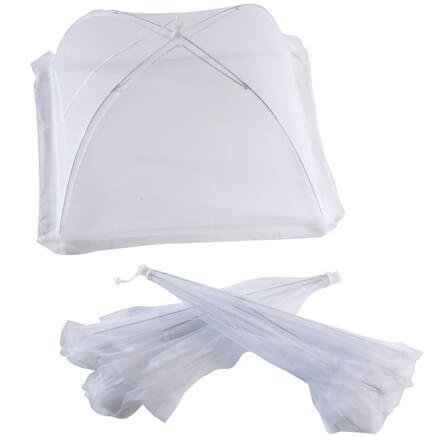 We go camping alot & when you've set table & are adding food items to table, this will help protect from wind & bugs! 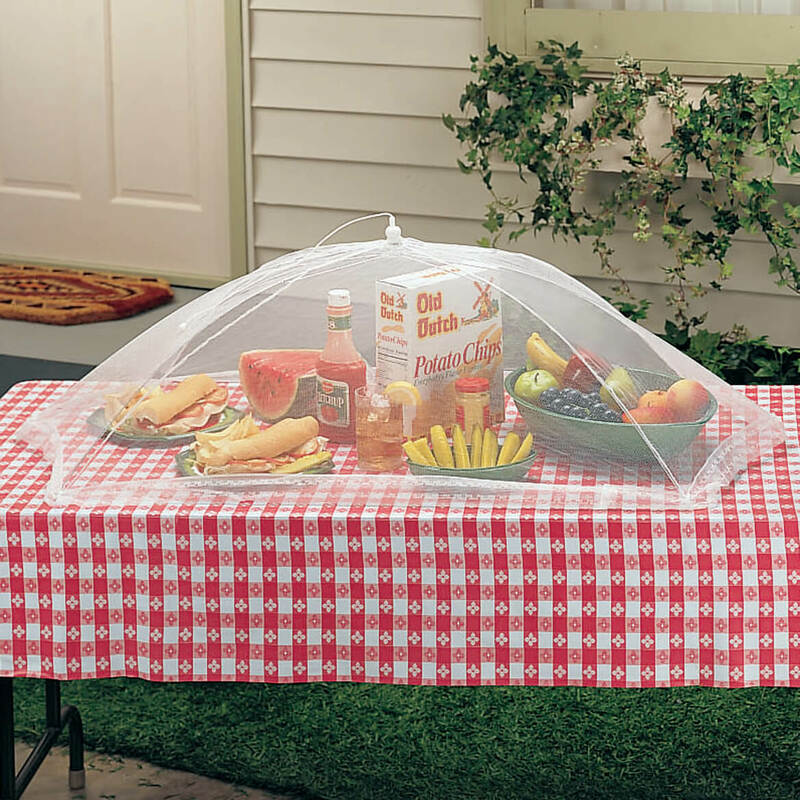 I chose this item because every 4th of July our family does an outdoor bbq/picnic and every year I say to myself why didn't I buy one of those food umbrellas as protection from the bugs ! So this year when it comes around I'll be ready! 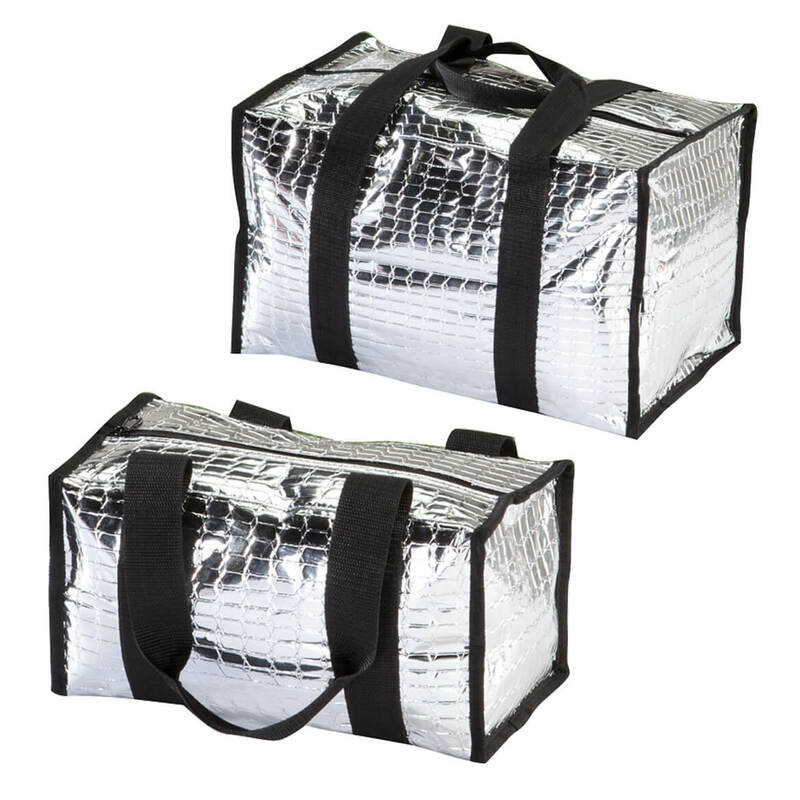 I chose this item because we bbq outside all Spring Summer and Fall and I can use these to protect my food and the price was great!! I want to see if it will protect my strawberries from bugs or bunnies. 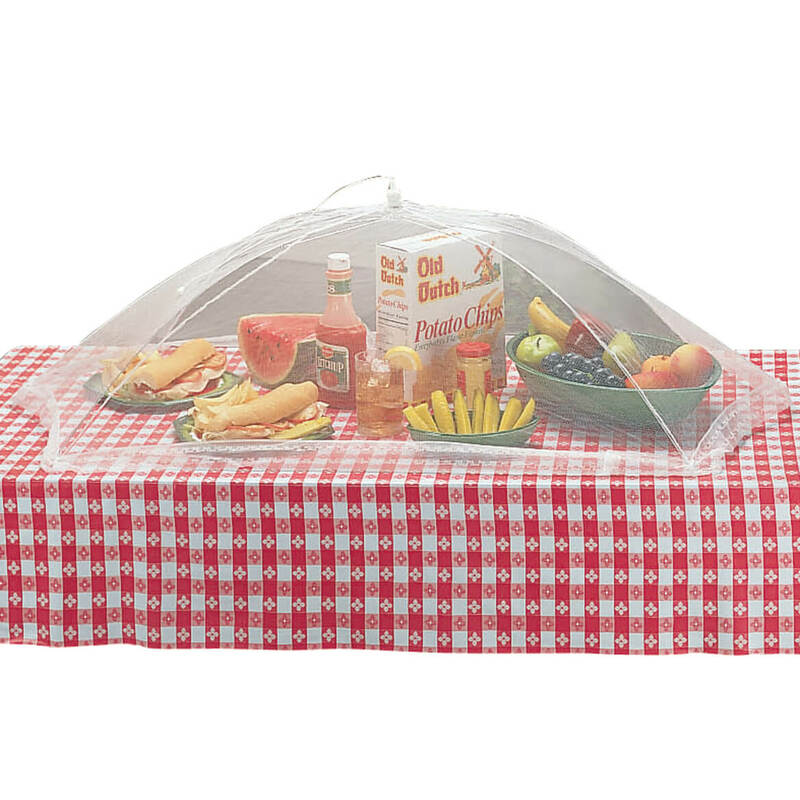 I chose this item to protect my food from the insects when picnicing. love these....so helpful at our church pie fund raiser in the park. people could still see the pies, and kept the flies away!!! For a large picnic in the beach. It was perfect. Is much more convenient than several smaller food umbrellas. very helpful on the deck during cookouts. Covers even those awkward shaped dishes. I've used these covers before and they are very handy. and your food away from fies when barbecuing. What are the dimensions of this food tent? BEST ANSWER: Thank you for your question. The cover is 24" long x 48" wide x 16" high inside. We hope this information will be of help to you.